This vertical down airflow, HEPA (High Efficiency Particulate Air) filtered, conveyor oven utilizes a pressurized air distribution plenum to supply air outlet uniformity of ±2.8°C (±5°F). Oven provides extremely consistent and repeatable process results at temperatures up to 260°C (500°F) and at better than class 1000 cleanliness. A workhorse oven designed for the most demanding clean process requirements. Despatch's LCC and LCD Clean Process Benchtop Ovens have a stainless steel interior and exterior, rugged, programmable process controls and provide a variety of tailored options for your specific needs. Typical applications for these ovens include die-bond curing and other semiconductor packaging processes, depyrogenation, sterilizing and drying for life sciences. 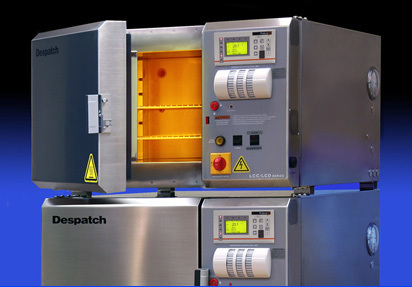 Despatch’s LCC/LCD2-14 Clean Process Cabinet Ovens are designed to meet the demands of production and large scale R&D environments. A variety of tailored options are available to meet your specific needs. 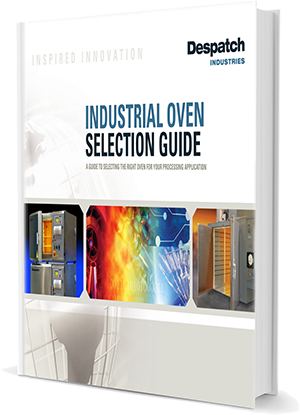 Typical applications for these ovens include die-bond curing and other semiconductor packaging processes, depyrogenation, sterilizing and drying for life sciences. 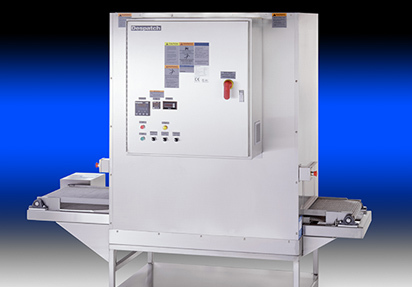 The PCO2-14™ polyimide cure solution is a clean process oven designed for polyimide baking, curing, and sterilizing applications. 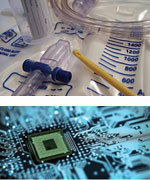 In many semiconductor manufacturing environments, front-end machines are adapted for polyimide curing. The PCO2-14™ optimizes the polyimide curing process for semiconductor wafer devices. 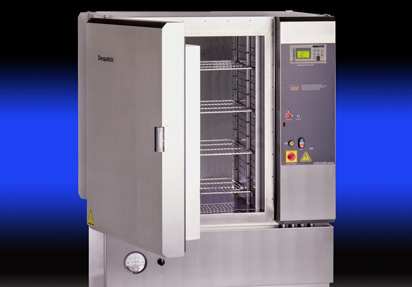 Despatch offers a variety of clean room ovens that are designed to meet the strict requirements of clean process applications. The ovens that Despatch offers are available in many different sizes and configurations to meet specific temperature and cycle requirements. All clean process ovens have stainless steel interiors and HEPA filters. HEPA filtration of the air inside the oven allows for a clean environment to cure epoxy or to dry parts. Stainless steel interior and exterior allow for easy cleaning. 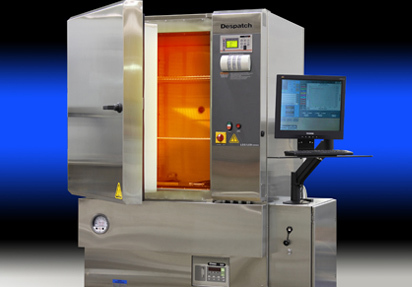 Despatch clean room ovens offer exceptional thermal performance that consistently produces high quality end product. 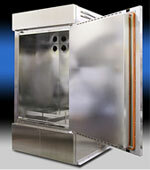 Despatch designed this custom clean room oven for a customer to dry their semiconductor parts in a clean room environment. The cabinet of this oven was sized and configured to maximize the amount of product dried in the oven in each batch and optimize throughput capabilities. The custom oven features a HEPA filter for Class 10 (ISO Class 4) air quality. The interior of the oven is manufactured with electro-polished 316 stainless steel. Despatch designed this inert atmosphere clean process oven for a customer in the semiconductor industry performing stress baking of wafers for memory products. This LCD model oven offered lower oxygen content, temperature capabilities up to 350°C and features stainless steel interior and exterior.